Chronic administration of Aluminum is proposed as an environmental factor that may affect several enzymes and other biomolecules related to neurotoxicity and Alzheimer's disease (AD). APE1 a multifunctional protein, functions in DNA repair and plays a key role in cell survival versus cell death upon stimulation with cytotoxic agent, making it an attractive emerging therapeutic target. The promising protective effect of resveratrol (resv), which is known to exert potent anti-inflammatory effects on neurotoxicity induced by aluminum chloride (AlCl3), may be derived from its own antioxidant properties. In the present work we investigated the modulation of APE1 expression during AlCl3-induced neuroinflammation (25 mg/Kg body weight by oral gavages) in experimental rats. We tested the hypothesis that a reactive oxygen species (ROS)-scavenger, resveratrol at 0.5 mg/kg bodyweight, which is known to exert potent anti-inflammatory effects, would attenuate central inflammation and modulate APE1 expression in AlCl3-fed rats. Neuroinflammation-induced genes including β-secretase (BACE), amyloid-β precursor protein (APP), presenilin 2 (PSEN-2) and sirt-2 were determined by RT-PCR. APE1 is determined at mRNA and protein levels and confirmed by immunohistochemistry. The expression of pro-inflammatory cytokines (TNF-α, IL6) and iNOS by the rat brain extract were measured by RT-PCR. Our results indicate that resveratrol may attenuate AlCl3-induced direct neuroinflammation in rats, and its mechanisms are, at least partly, due to maintaining high APE1 level. Resveratrol co-administration with aluminum chloride exerted more protective effect than pre-administration or treatment of induced rats. A significant elevation of APE1 at both mRNA and protein levels was observed in addition to a marked reduction in β-secretase and amyloid-β. We found that AlCl3 stimulated the expression of TNF-α, IL-6, and iNOS in rat brain in which NF-κB was involved. Resveratrol inhibited AlCl3-induced expression and release of TNF-α, IL-6, and iNOS in rat brain. These findings establish a role for APE1 as a master regulator of AlCl3 dependent inflammatory responses in rat brain. In addition, there was an ameliorative change with resveratrol against AlCl3-induced neurotoxicity. These results suggest that rat brain cells produce pro-inflammatory cytokines in response to AlCl3 in a similar pattern, and further suggest that resveratrol exerts anti-inflammatory effects in rat brain, at least partly, by inhibiting different pro-inflammatory cytokines and key signaling molecules. It might be a potential agent for treatment of neuroinflammation-related diseases, such as AD. Aluminum is a well-documented neurotoxin that enhances neuroinflammatory events in the brain by different mechanisms. 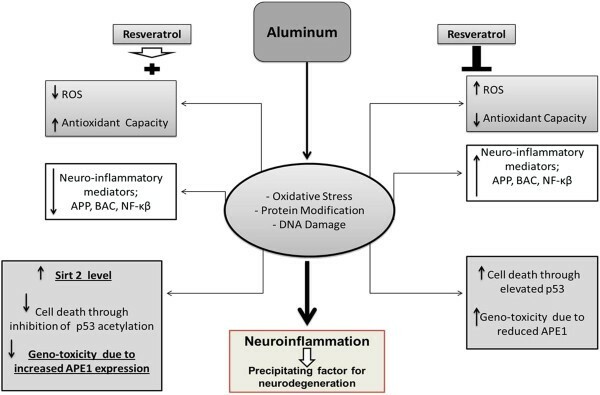 Aluminum exacerbates oxidative stress, amyloid beta (Aβ) deposition, and plaque formation in the brain of transgenic mice that overexpress amyloid beta (A4) precursor protein (APP) . Both Aβ and aluminum are able to potentiate reactive oxygen species (ROS) formation that will lead to genotoxicity and DNA damage. The mammalian ap-endonuclease, APE1/ref-1, is a ubiquitous and remarkably multifunctional protein. It plays a central role in the base excision repair (BER) pathway for damaged bases and DNA single-strand breaks induced by ROS and alkylating agents . APE1 was independently identified as a reductive activator factor and named redox effector factor 1 (Ref-1) . A third and distinct function of APE1 as a trans-acting factor was also discovered [4, 5]. 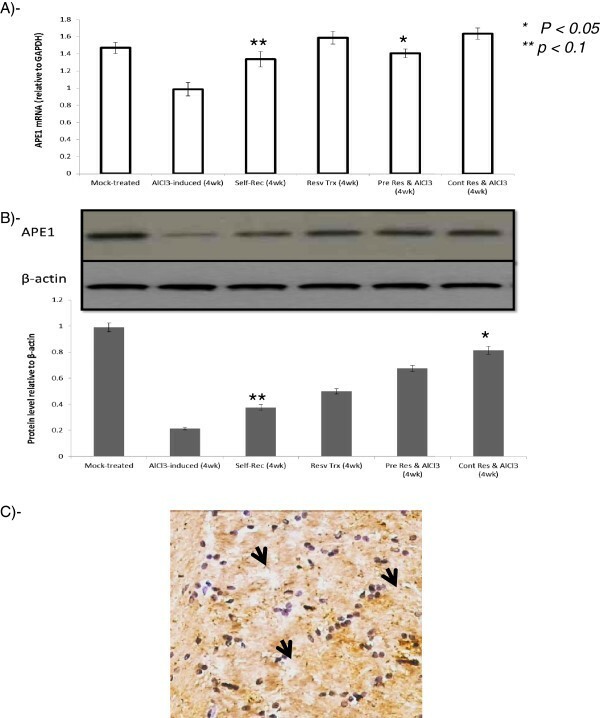 Several studies showed that global cerebral ischemia or traumatic brain injury or cold injury-induced brain trauma  induced oxidative stress decreases APE1 expression in the hippocampus and is associated with neuronal apoptosis in rats [7, 8]. This specific inhibition of APE1 expression may affect the extent of apoptosis after ischemia. Consistently, overexpression of WT APE1 in hippocampal and sensory cells reduced neuronal death . Moreover a very recent study by Mantha et. al.,  indicated that APE1/Ref-1 exerts neuro-protective role via its association with different intracellular proteins in Aβ (25–35)-treated rat pheochromocytoma, PC12 and SH-SY5Y cell lines, which could modulate their cellular functions during Aβ-mediated neurotoxicity. The polyphenolic compound resveratrol (3,4',5-trihydroxy-trans-stilbene) is a naturally occurring phytochemical which has been found in a large number of plant species that are components of human diet, including mulberries, peanuts, grapes and red wine. Its physiological function is thought to serve as phytoalexin protecting plants against environmental stress or pathogen attack. Accumulating evidence suggests that resveratrol may exert a protective effect in the CNS under pathological conditions, and that resveratrol is associated with reduced risks of cardiovascular disease, cancer, diabetes and AD [11–13]. Resveratrol has been found to exert protective effects against neuroinflammation in both in vivo and in vitro studies. 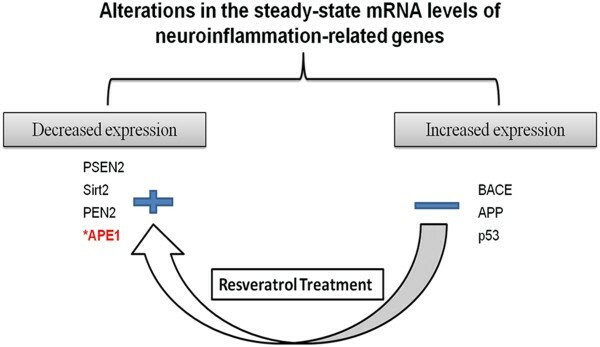 These activities of resveratrol appear to target activated microglia, resulting in the reduction of pro-inflammatory factors through the modulation of signal transduction pathways. Activated microglia and astrocytes, the main glial cell type, serve immune surveillance functions and are involved in maintaining CNS homeostasis. They also respond promptly to injury and regulate neuroinflammatory events [14, 15]. Over-activation of glial cells and release of pro-inflammatory cytokines may lead to neuronal death [16, 17], causing neuropathological changes in CNS diseases such as multiple sclerosis , Parkinson's disease  and Alzheimer's disease . Therefore, limiting inflammatory cytokine production by activated microglia and astrocytes should be beneficial for prevention of neuroinflammation and neurodegeneration. One of the potential mechanisms for resveratrol-mediated neuroprotection is activation of the Sirt1 pathway, which in turn suppresses the activation of the NF-κB signaling pathway . The overall effects are to reduce pro-inflammatory mediators, eventually producing neuroprotection. Sirt1could also protect neurons against microglia-dependent Aβ toxicity via the suppression of NF-κB pathway . Yamamori et. al.,  reported that APE1 is a target of the Sirt1 protein deacetylase. Sirt1 associates with APE1, and this association is increased with genotoxic stress and cell vulnerability is rescued by overexpression of APE1. Activation of Sirt1 with resveratrol promotes binding of APE1 to the BER protein X-ray cross-complementing-1 (XRCC1), while inhibition of Sirt1 decreases this interaction, which suggests that Sirt1 plays a vital role in maintaining genomic integrity through regulation of the BER pathway. In the present study we show for the first time the involvement of APE1 modulation in resveratrol-mediated therapeutic and/or protective activity against aluminum chloride-induced neurotoxicity in rats. We examined also the expression of pro-inflammatory cytokines (TNF-α, and IL-6) and of iNOS in brain extract in response to AlCl3 exposure, as well as the NF-κB signaling pathway. Total of forty male adult Wistar rats (120–190 g) were supplied and maintained at Medical Research Institute in which the principles of laboratory animal care were followed in all protocols and were approved by ethics committee of animal research facility. Rats were maintained under controlled temperature (25°C) and constant photoperiodic conditions (12:12-h daylight/darkness). The dams had free access to water and standard commercial chow. Neuroinflammation was induced using AlCl3.6H2O. Animals were divided into three major groups as illustrated in Figure 1. Induced rats received AlCl3.6H2O (25 mg/ kg) daily for duration of one month by oral gavages. Resveratrol was administered by gavage in the form of resveratrol and green tea complex (0.5 mg/ kg). Three rats from each group were sacrificed by cervical dislocation at time intervals 2 and 4 weeks of AlCl3 administration and at weeks 8 and 12 of resveratrol treatment or self-recovery. Brains were rapidly removed from the skulls and dissected into different regions. Parts of the Cortex and hippocampus regions were removed for histochemical studies by fixation with10% buffered-saline formalin. The remaining sections were stored at −80°C for extraction of total RNA and enzyme assays. Part of the brain tissue (10% w/v) was washed with saline solution minced and homogenized in ice cooled buffer 1.15% KCl, 0.01 M sodium phosphate buffer pH 7.4. Concentration of GSH was determined as described by Ellman . Part of the brain tissue (10% w/v) was washed with saline solution, minced and homogenized in ice-cooled 50 mM potassium phosphate buffer pH 7.5. Level of lipid peroxidation was determined according to Ohkawa e.t al.,  method. Brain tissue was homogenized in ice-cooled buffer (100 mM potassium phosphate, pH 7.0 containing 2 mM EDTA) per gram tissue. GST was assayed according to Habig et. al., method . Part of brain tissue was homogenized in ice-cooled homogenization buffer (50 mM potassium phosphate, pH 7.4, 1 mM EDTA and 1 ml/L Triton X-100). Catalase activity was assayed according to Aebi procedure . AST activity assay in brain tissues was preformed according to the method described by Reitman and Frankel  with some modifications. Briefly part of mid-brain tissue was dissected, washed in ice-cooled saline and homogenized in total protein extraction buffer (10 mM HEPES, 350 mM sucrose, 5 mM EDTA, pH 7.4, 1% of Triton-X100, and protease inhibitor cocktail) then centrifuged at 4,000 rpm for 15 min at 4°C. Ten microlitters of the supernatant were used for AST activity assay as described before . This quantification was done using commercially available rat amyloid beta peptide 1–40 (Aβ1-40) ELISA Kit (Cusabio, cat# CSB-E08302r) and according to manufacturer's instruction with some modifications. Briefly brain tissues of experimental animals were isolated at the end of each experimental phase, washed in ice-cooled saline and homogenized in extraction buffer containing 10 mM HEPES, 350 mM sucrose, 5 mM EDTA, pH 7.4, 1% of Triton-X100, and protease inhibitor cocktail. The homogenates were analyzed and Aβ-40 was calculated as (pg/ml/g. tissue). Total RNA was extracted from frozen brain tissues according to the method of Chomczynski and Sacchi procedure . Alteration in the steady–state mRNA levels of genes relevant to neuroinflammation pathogenesis (Figure 2) was determined using semi-quantitative reverse transcriptase PCR analysis. Using one-step RT-PCR (RT/PCR Master Mix Gold Beads, BIORON) reaction, the cDNA was synthesized and used for amplification of target gene(s) primers sequences: Amyloid beta (A4) precursor protein (APP)-F: AGAGGTCTACCCTGAACTGC, R: ATCGCTTACAAACTCACCAAC- 154 bp; beta secretase (BACE)-F: CGGGAGTGGTATTATGAAGTG, R: AGGATGGTGATGCGGAAG, 320 bp ; presenilin 2 (PSEN2) F:GAGCAGAGCCAAATCAAAGG,R-GGGAGAAAGAACAGCTCGTG,188 bp; Sirt2 F:ACCTTCCTTCAGTCCCGTTT,R: AAGGGTTCACAGTGGTGGAG,173 bp; TNFαF:ATGAGCACAGAAAGCATGATCCGCG,R:CCCTTCACAGAGCAATGACTCCAAA; IL-6-F: GATGCTACCAAACTGGATATAATC, R:GGTCCTTAGCCACTCCTTCTGTG; iNOS-F: TGGGAATGGAGACTGTCCCAG, R:GGGATCTGAATGTGATGTTTG; β-actin-F: TGTGATGGTGGGAATGGGTCAG, R: TTTGATGTCACGCACGATTTCC. Outline of the neuroinflammation-induced genes in AlCl 3 -induced versus resveratrol-treated state. Real time-PCR (qRT-PCR) was used to measure the mRNA expression levels of APE1 gene. CDNA was synthesized by High-Capacity cDNA Reverse Transcription Kit according to the manufacture`s protocol. APE1 Primers sequence: 5’-GCTTGGATTGGGTAAAGGA-3’ and 3’TTCTTTGTCTGATGGAGCTG-5’; GAPDH primers: 5’-GTATGACTCTACCCACGGCAAGT-3’and 5’-TCTCGCTCCTGGAAGATGGT-3’. APE1 was normalized to GAPDH and the fold difference calculated using the equation 2−ΔΔCt as described before . Total cell extracts were prepared by homogenization of 50–100 mg of tissue in lysis buffer (50 mM Tris–HCl, pH 7.5, 150 mM NaCl, 1 mM EDTA, 1% TritonX-100, and protease inhibitor cocktail). Nuclear extract was prepared as described by Schreiber et. al., . Western blots were performed as described previously by Burnette , APE1 and NF-κB immunoblots were performed on prepared total and nuclear cell extracts respectively. Primary antibody to APE1 (sc-17774), NF-κB (NB100-2176) and β-actin (sc-81178) were used. Antibody binding was detected following appropriate secondary antibody using chemiluminescence detection, and equal loading was confirmed by probing with β-Actin monoclonal antibody. All experiments were performed in duplicate or triplicate independently and typical graphs are presented in some cases data are expressed as Mean± SD. Data were analyzed by student’s t- test and difference was considered significant from control when p < 0.01. ANOVA test was used to compare the statistical difference between groups. The results are considered significant when p < 0.05. Oral AlCl3 administration for four weeks was tolerated by the majority of rats, with less than 3% mortality. Initially all rats lost few grams of the body weight during the first 10 days of the study. However, rats in all groups re-gained weight and continued to grow normally for the duration of the study. Analysis of anti-oxidant capacity represented by GSH and MDA levels as well as catalase and GST activities revealed that AlCl3- induced significant elevation in MDA along with marked reduction in GSH contents, GST and catalase activities at weeks 2 and 4 compared to mock-treated group at week zero (p < 0.01, Figure 1A-D). Pre- and cont- resveratrol administered groups 3a & b, showed higher anti-oxidant capacity compared to self-recovery (p<0.05, Figure 3). However, continuous resveratrol administration is shown to be more protective compared to both self-recovery and pre- groups (p < 0.01, p < 0.05, Figure 3). Total anti-oxidant capacity in AlCl 3 -induced versus resv-treated rats. A significant reduction in GSH contents as well as GST and catalase activities during the four weeks of AlCl3 administration while MDA level was increased significantly (*p < 0.01) compared to control. Pre-and continuous resveratrol administration ameliorated toxicity by maintaining high GSH level and enzymes activities. 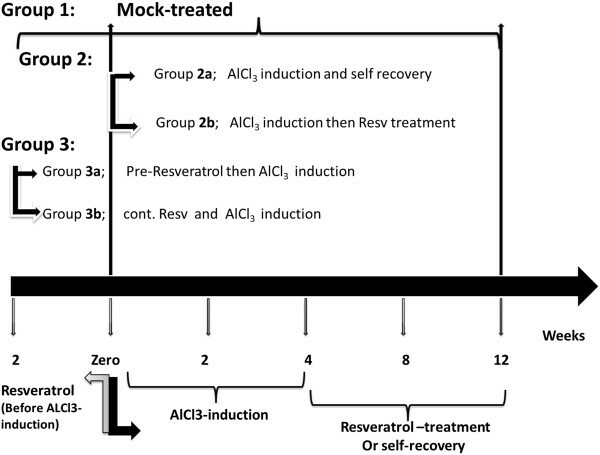 Also we show that resv-treated rats post AlCl3 induction improved the total antioxidant capacity in both pre-and cont- compared to self-recovery group (**p < 0.05). AlCl3-induced neurotoxicity was further assessed by measuring tissue AST activity, which is important enzyme in brain that is strongly related to amino acid homeostasis. The results indicated significant (p < 0.01) reduction in AST activity in the induced rats. While resveratrol administration markedly improved (p < 0.01) AST activity in different experimental groups as represented in Figure 4A. Brain AST activity and Aβ 40 level. A- alterations in brain tissues AST activities (mid brain) indicating significant reduction during the four weeks of AlCl3 administration compared to control (P < 0.01). Pre- and continuous resveratrol administration ameliorated toxicity by maintaining tissue integrity and hence elevated AST activity. B- Aβ 40 concentration significant reduced in AlCl3-induced versus resv-treated rats. Pre-and continuous resveratrol significantly (p < 0.01) maintained high Aβ 40 level upon AlCl3 administration. Furthermore by detecting the level of Aβ 40, which is considered target for Alzheimer's therapy, in experimental rats` brain we found that resveratrol-induced significant elevation (p < 0.01) in its level compared to AlCl3-induced rats (Figure 4B). Alterations in the expression of neuroinflammation related markers (Figure 2), post AlCl3 feeding at weeks 4 and 8 (groups 2a, b and 3b) was tested by semi-quantitative PCR. 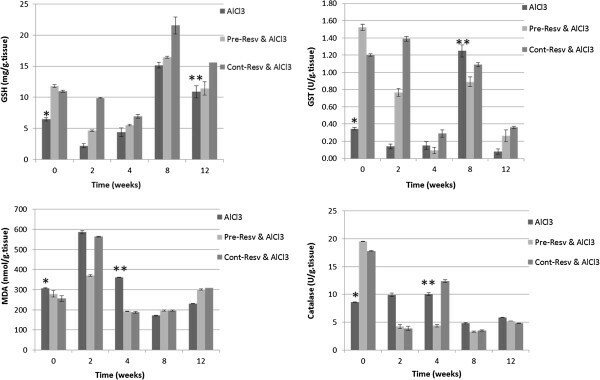 Strong expression of APP, BACE and p53 were observed in the induced group that received no resveratrol during the course of induction compared to lower expression in the continuously administered group at week 4 (Figure 5A). A decrease in the mRNA of all pro-inflammatory mediators was observed in resv-treated rats compared to self-recovery group (2a and 2b respectively). Interestingly, we found that resv continuous administration exerted more protection through marked inhibition of inflammatory markers (Figure 5A, group 3b at weeks 4 and 8) and induction of PSEN2 expression in both groups. By testing sirt-2 expression we found that resveratrol treatment induced sirt-2 expression in pre-, cont- and treated groups which indicate that sirt-2 is involved during neuronal recovery from injury (Figure 5B). Expression profiles of neuro-inflammation related genes. Semi-quantitative RT-PCR was used to detect mRNA levels of APP, BACE, PSEN2, p53 and sirt-2. A-Our results indicate that AlCl3 administration induces elevation in APP, BAC and p53 levels at week four (group2a), while resv treatment (group 2b) caused marked reduction in all parameters mRNA levels compared to self-recovery group (2a at week 8). 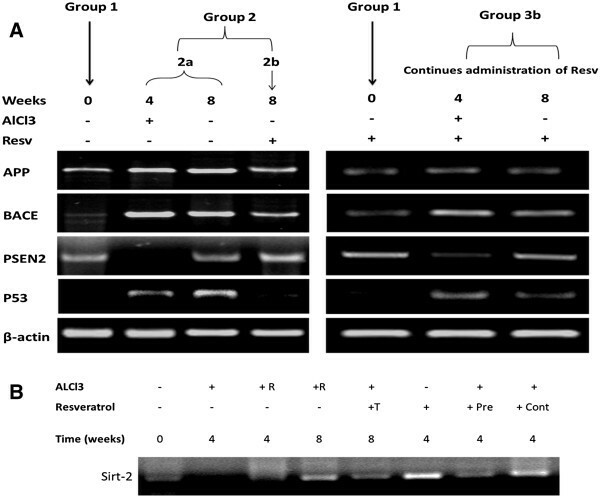 Co-administration of resv during AlCl3 induction and for four weeks later ameliorated neurotoxicity by reducing mRNA levels of pro-inflammatory genes as shown in group3b at weeks 4 and 8. Moreover PSEN2 expression is induced in resv treated groups 2b and 3b. 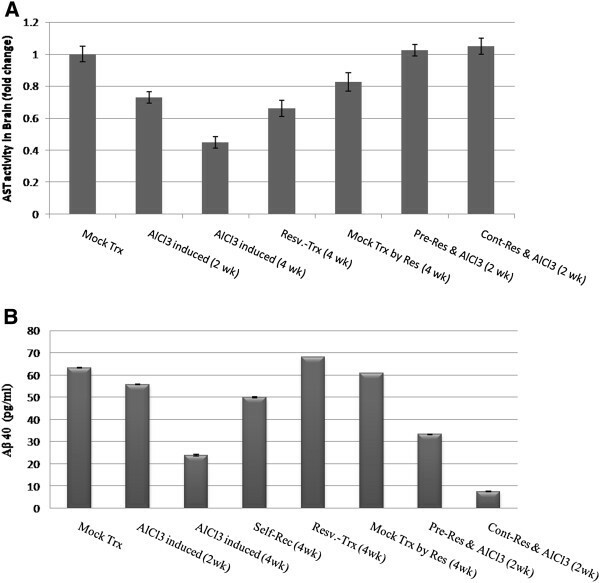 B- Resveratrol induces Sirt-2 in mock-treated group and resveratrol treatment of AlCl3-induced group induces sirt-2 expression as well. Because activation of Sirt1 pathway, which in turn suppresses the activation of the NF-κB signaling cascade, is one of resveratrol well documented mechanism for reduction of proinflammatory mediators, therefore we measured NF-κB transcription factor activity as well as protein level. NF-κB activity as well as p105 complex dissociation were elevated significantly in AlCl3-induced group in time-dependent manner compared to mock-treated group (p < 0.01, Figure 6 A & B). On the contrary, pre- and cont- resveratrol administered groups showed significant reduction in NF-κB activity as well as p65 dissociation from p105 complex compared to induced group (p < 0.05, Figure 6 A & B). Furthermore we examined the effect of resveratrol on AlCl3 -induced proinflammatory cytokine expression in rat brain homogenate. As shown in Figure 6C, AlCl3 markedly increased TNF-α, IL-6 mRNA expression in rat brain homogenates. Continuous resv administration exerted more inhibitory effect on cytokines and iNOS expression than pre-administration (Figure 6C). NF-κB, cytokines and iNOS profile in different experimental groups. A & B) Change in NF-κB activity and protein levels were detected in induced versus resveratrol administered groups. We show that AlCl3 administration induced significantly (*p < 0.01) NF-κB activity with more p65 dissociation from the p105 complex as represented in the western blot. On the contrary co-administration of resveratrol with AlCl3 in both pre- and con- groups significantly decreased (**p < 0.05) NF-κB activity as well as p105 complex dissociation (B). Resveratrol inhibits AlCl3-induced TNF-α, IL-6 cytokine and iNOS expression in rat brain (C). APE1 was detected at both levels mRNA using qRT-PCR and protein using western blotting as well as by immunohistochemistry. AlCl3 oral administration for 4 weeks significantly reduced APE1 both at mRNA and protein levels versus mock-treated group (p < 0.01, Figure 7). Although resveratrol treatment was observed to act through induction of APE1 expression, we also observed that during self-recovery of injured- rats, brain APE1 level is elevated significantly (p <0.01, p < 0.05, Figure 7A-B).Very interestingly, pre- and cont-resveratrol administration with AlCl3 maintained high APE1 mRNA and protein and exerted more protective effect than post-lesion treatment (p < 0.01, p < 0.05, Figure 7A-B). Moreover immunohistochemical investigation showed strong cytoplasmic labeling of APE1 in brain sections of continuously administered group that received resv during AlCl3 induction (Figure 7C). Changes in APE1 mRNA and protein levels. A-mRNA was determined using qRT-PCR. A significant reduction (p < 0.01) in group 2a at 4 weeks of induction was observed. APE1 mRNA was elevated during self-recovery (group 2a at week 8) as well as during the four weeks of resveratrol treatment. Pre- and cont- resveratrol administration maintained significantly elevated (p < 0.01) APE1 compared to induced group. B- APE1 protein profile shows the same pattern and change in parallel to mRNA as indicated in all groups. C-Immunohistochemical analysis of continuously resveratrol administered group indicated strong cytoplasmic expression of APE1. * indicates significance from control at p < 0.01, while ** indicates significance between groups at p < 0.05. Oxidative stress and extensive DNA damage has been reported as contributing factor in different diseases including neuronal degeneration. The arguments on the role of Aluminum (Al)-induced oxidative stress and mediated neuronal loss may help in understanding the role of Al in Alzheimer’s disease (AD). Neurons appear to be particularly vulnerable to free radicals. Al, which is a stress-inducing agent in endoplasmic reticulum, has been shown to activate the expression of various genes that are important in growth arrest and DNA damage induction, and NF-κB, which initiates apoptosis . To explore the mechanism of resveratrol on the attenuation of AlCl3-induced neuroinflammation, the expression of TNF-α, COX-2 and APP protein expression was detected by RT-PCR, as well as induction of NF-κB in the rat brain by western blot. Our findings are in agreement with Wu Z et. al., report  and clearly show that resveratrol attenuates AlCl3-induced neuroinflammation. We demonstrate that continued resveratrol administration during the course of induction exerts more protective effect than pre- or after induction administration. By detecting total lipid peroxidation and glutathione contents in rat`s brain, a significant reduction in lipid peroxidation as well as a significant increase in brain glutathione contents were observed in all resveratrol treated groups versus induced rats. NF-κB which considered an important transcription factor in inflammatory responses can regulate the production of various pro-inflammatory factors . In the resting conditions, NF-κB is sequestered in the cytoplasm by binding to its inhibitors IκBs. In response to inflammatory stimuli, IκBs are rapidly phosphorylated and then degraded via IKK complex, followed by the release of free NF-κB dimers (p50 and p65) and subsequent translocation to the nucleus and thus regulating the expression of target genes. Sirt-1 upregulation could protect neurons against microglia-dependent Aβ toxicity via the suppression of NF-κB pathway . Therefore, we investigated the effect of resv as therapeutic and/or prophylactic agent on NF-κB activation and p105 complex stability. We found that resv co-administration during AlCl3-feeding resulted in a significant reduction in both NF-κB activity and p105 complex dissociation compared to resv-treated group and resv continues administration inhibited AlCl3- mediated NF-κB activation and complex dissociation. To further explore the resveratrol inhibitory effect on AlCl3- induced brain toxicity, we detected the mRNA level of neuroinflammation-regulated genes including APP, β-secretase (BAC), p53, Presenilin 2 (PSEN2), Sirt2, as well as APE1 as suggested new target for resveratrol-mediated neuro-protection. It has been shown that the abnormal processing of APP by β and γ-secretase enzymes is a key event in the development of Alzheimer's disease (AD) neuropathology, resulting in an increase in the generation of the 42 amino acid form of Aβ peptide which aggregates to form the insoluble amyloid plaques . The γ-secretase complex has not yet been fully characterized but minimally consists of four individual proteins including presenilin (PSEN) . Here we show that continued oral administration of resveratrol markedly repressed AlCl3-induced APP mRNA expression and decreased tissue Aβ 40 level through down regulation of BAC expression and also by reducing γ-secretase activity probably through down-regulation of PSEN2 as a regulatory subunit. Resveratrol-treated rats showed higher brain Aβ 40 levels compared to induced group. Jayadev et. al.,  report demonstrated that PSEN2 regulates CNS innate immunity through the finding that PSEN2 is the predominant γ-secretase in microglia and modulates release of proinflammatory cytokines, therefore PSEN2 may participate in a negative feedback loop regulating inflammatory behavior in microglia. In our model PSEN2 expression as a neuro-protective marker found to be induced by resveratrol administration either as treatment or protective agent, which clarify that PSEN2 is one of the resv-activated genes during neural regeneration. It has been reported that a redundancy of functions may exist between sirt-1 and sirt-2, and that sirt-1 and sirt-2 cooperate to deacetylate the tumor suppressor protein p53 to attenuate cell death . Moreover many reports highlighted the role of sirt1-sir2 as a target for resv-mediated action. Here we show that resv-induces the expression of sirt-2 which considered mitotic protein that promotes cell survival. We found that in mock-treated rats, administered only resv as a positive control for four weeks, a strong sirt-2 expression was detected compared to empty vehicle control group. Also resv treatment, pre- or cont- administration induced sirt-2 expression, suggesting a pivotal role for cytoplasmic protein sirt-2 during neural cells regeneration or protection. In neurons, base excision repair (BER) is the predominant mechanism for repair of oxidative DNA lesions. In addition it has been reported that Aβ level differentially modulates APE1 expression which may contribute to selective neuronal vulnerability in Alzheimer’s disease . The inhibition of Sirt1 signaling by AlCl3 is partially responsible for the activation of NF-κB pathways and subsequent generation of TNF-α in Kupffer cells and macrophages . Therefore, it should be quite interesting to investigate whether activation of Sirt1 signaling also contributes to the inhibitory effect of resveratrol on NF-κB activation by AlCl3 in rat brain cells. AlCl3 is capable of inducing production of pro-inflammatory cytokines and NO in treated rat brain, probably by both microglia and astrocytes . In agreement with our finding, aluminum causes oxidative damage as a pro-oxidant, both on its own and in synergy with iron. Aluminum also competes with, and substitutes for, essential metals—primarily Mg2+, iron and Ca2+ ions—in or on proteins and their co-factors. It was hypothesized that intra-neuronal aluminum may interfere with Ca2+ metabolism in the aged brain . 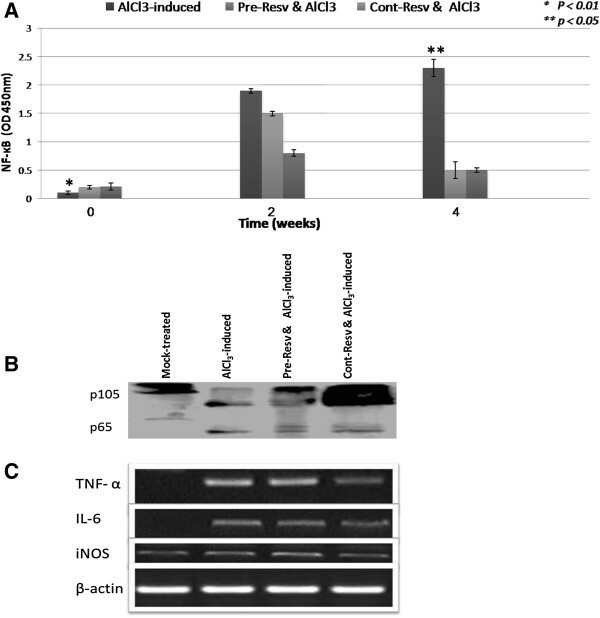 Our study shows that AlCl3 significantly induces the expression and production of pro-inflammatory cytokines (TNF-α, IL-6,), and enhances the expression of iNOS most probably by immuno-competent and phagocytic cells in CNS. We have previously investigated APE1 in different experimental models in a trial to explore and highlight a new role during tissue fibrosis [45, 46]. Consistently in the present study, by investigating APE1 expression in neuroinflammation model, the results revealed that AlCl3 significantly reduces both APE1 mRNA and protein levels. Furthermore, we show that in rats that did not receive any treatment post-lesion-induction and in self-recovery group, APE1 mRNA and protein levels started to re-elevate, which indicate that APE1 is essential during neuronal repair and regeneration. However APE1 level was also elevated in resv-treated group, but continuous revs administration seems to exert more protective effect on rat`s brain as indicated from the alterations in neuroinflammatory mediators expression which suggests that resv action is mediated, in part, by maintaining elevated APE1 level. Since it has been reported that p53 downregulates APE1 expression  and p53 transcriptional activity is modulated by sirt1 and sirt2 through deacetylation , we propose p53/APE1 signaling pathway as a novel resv-mediated target (Figure 8). We believe that understanding the molecular balance between total oxidant versus antioxidant capacities as well as pro-apoptotic versus pro-survival proteins during neuroinflammation is essential for therapeutics development. Postulated mechanism of resveratrol protective effect against AlCl 3 –induced neurotoxicity. APE1/Ref-1 (APE1), a multifunctional protein possessing both DNA repair and transcriptional regulatory activities, has a pleiotropic role in controlling cellular response to oxidative stress such as exposure to neurotoxic agents. We have uncovered some important role of APE1 during neuroinflammation and consequently neurodegeneration pathogenesis. Our results suggest that the extent of inflammatory responses induced by AlCl3 in the main resident immunocompetent and phagocytic cells in CNS could be limited by resveratrol by maintaining high APE1 and may contribute positively to neuronal cell survival following exposure to cytotoxic agents. This work was supported by Science-REP-2011, BA/CSSP-2010, N€uromed FP7 number 245807 and STDF number 4237 projects. We also thank Alexandria University for paying the publication fees. AZ and BM performed the experiments and analyzed the data. MM and KK provided useful advice and reviewed the manuscript. AZ and AB conceived the study, participated in its design and coordination, and wrote the manuscript. All authors read and approved the final manuscript.